Napa Cab lovers, those inclined to lush, rich, silky but powerful Cabernet….this one is SO for you!! We bought every single bottle the winery had left…what a jaw-dropper of a deal! 2013 vintage to boot! Super limited ---- literally the last bottle EVER to be sold! 50% OFF -- how do we do it? Man, deals like this are why it’s so great to be a local. Bill Price, owner of Three Sticks, basically retired the high-end, pricey Napa Cab program in 2013 to focus on pinot and chardonnay going forward. We heard that, and called to see if there was any Cab left (insert big grin). And here you are. An incredible, pretty massive no-brainer on a powerful (of the 2013 vintage Antonio Galloni proclaimed “the most profound, riveting, young wines I have tasted anywhere in the world”), intense, rich wine to drink or cellar for another decade (our bottles will never make it anywhere near that long!). Mocha. Not a frappuccino, sweet, cloying mocha, we’re talking chewy DARK cocoa, semi-sweet chocolate mocha, with an intense, almost jammy blackberry fruit, blueberries, incense, dried flowers...it’s BIG and plush, and hangs on to your mouth for a good while, with more touches of spice and sweet tobacco. Yup, it’s all that….but there is so little, if you read this far, it might be gone…. The 2013 Three Sticks Cabernet Sauvignon is the last Cabernet ever bottled by Three Sticks and we have the final bottles. 2013 is the year that Robert Parker labeled the “greatest vintage in 37 years” for Napa. And it so happened that upon the 2014 retirement of legendary winemaker Don Van Staaveren, maker of the Wine Spectator’s 1999 Wine of the Year (the 1996 Chateau St. Jean Cinq Cépages), Three Sticks opted to abandon Cabernet Sauvignon entirely. Three Sticks Wines is a boutique, family-owned winery led by veteran winemaker Bob Cabral. Cabral's commitment to crafting small-lot, artisanal wines from exceptional Sonoma Coast vineyards, including Durell Vineyard, Gap's Crown Vineyard and Walala Vineyard, drives the winery's focus of creating site specific wines. 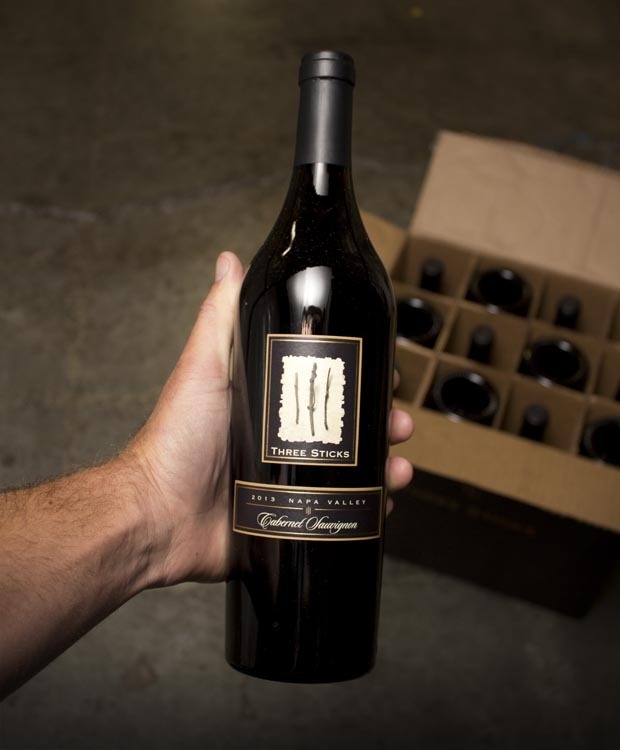 Founded in 2002, the winery is named for owner William S. Price III's surfing nickname, "Billy Three Sticks," assigned to him in his youth as reference to the Roman numeral that follows his name. Three Sticks has a down to Earth approach to growing and winemaking, they believe in table fellowship as the power of wine to bring people together.